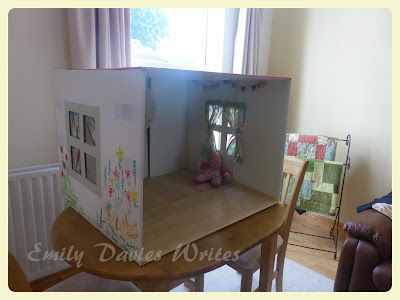 My mum is the type of person who looks at a big cardboard box and thinks "That would make the perfect playhouse for Ruby!"... and then she makes one. 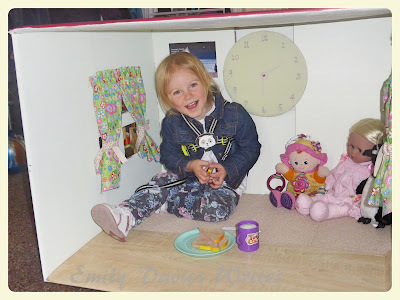 I'm the type of person who looks at a big cardboard box and thinks "That would make the perfect playhouse for Ruby!"... 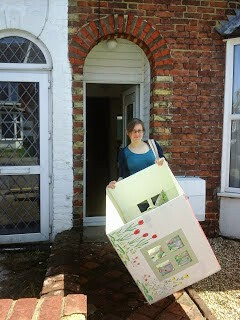 and then I will store said cardboard box under the stairs for a year before discarding it in the recycling. 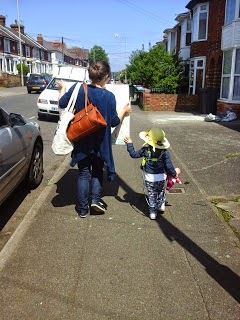 Thank God for Mums (or Nanas)! So, my mum had ordered some new light fittings and they arrived packaged in a huge cardboard box. 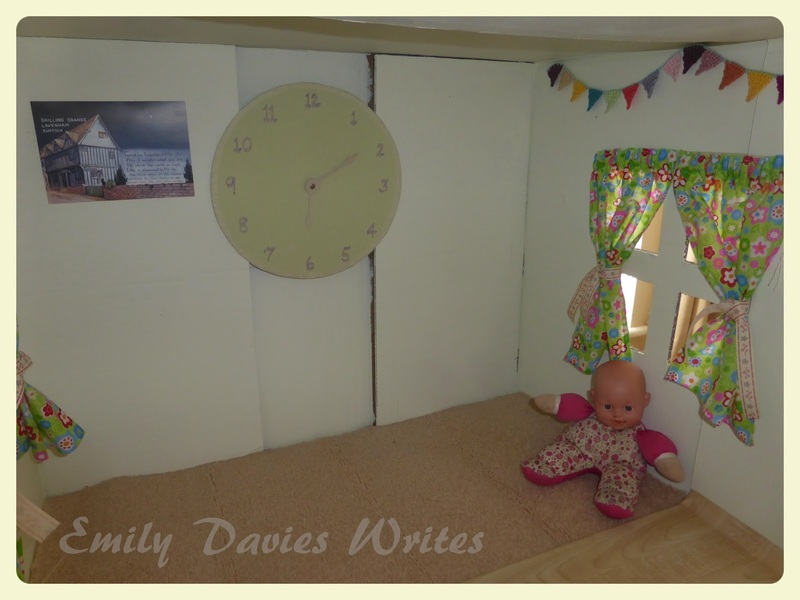 It wasn't long before she had transformed this box into a carpeted, decorated and soft-furnished den for my very lucky two year old! As you can see, it is decorated inside and out with emulsion paint, has windows, carpet, laminate flooring, curtains, bunting, a clock and a picture hanging, as well as the outside possessing some rather attractive flowers - all made with things my mum had lying around the house, either languishing in her craft stash or the leftovers and offcuts of DIY projects from years gone by. 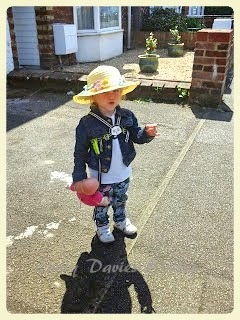 Upon arriving home, Ruby wasted no time climbing inside with her dollies and embarking on a picnic. She absolutely loved playing inside and slowly all the kitchen play things have made their way inside, along with cushions and blankets. In fact, by the time bed time rolled around I thought she was going to want to camp in there! She was all snuggled up with a blanket reading a book. 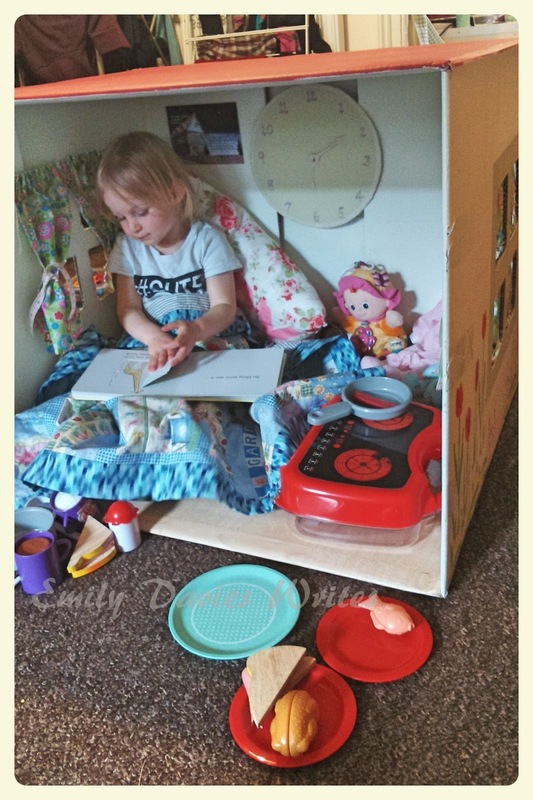 So, just goes to show what fun you can have with a cardboard box and that toys don't have to be expensive. I know she'll grow out of it pretty quickly and it might suffer a bit from wear and tear, but seeing as it cost pennies to create it's all worth it to see the smile on her face! I remember as a child how magical it was to have little dens and spaces to crawl into and enjoy some private time and I hope she'll enjoy this in that way over the coming months - maybe as a little reading nook or something! ... and here's a pic of Ruby in her springtime hat that my mum had embellished for her with crochet flowers... just 'cause it's cute!